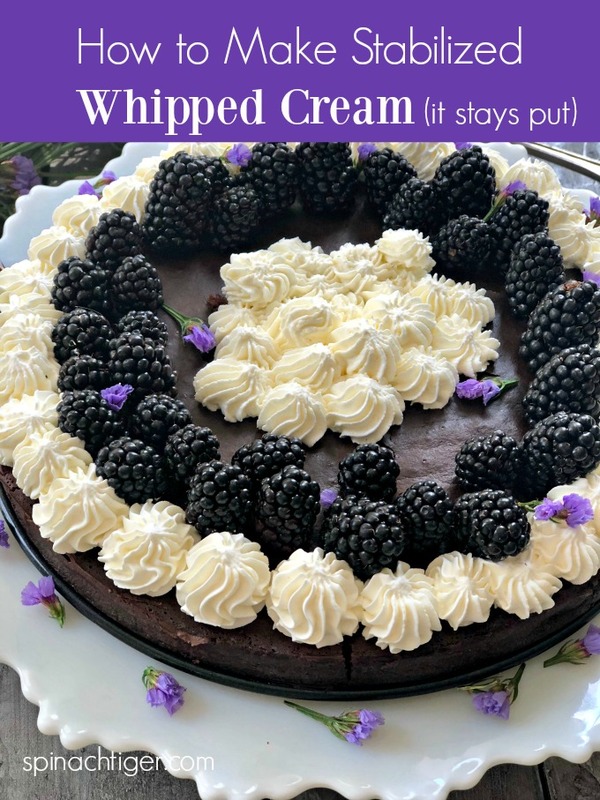 One of the best ways make a dessert special is to use this stabilized whipped cream icing recipe. It’s a lot less sweet than a confectioner’s sugary frosting and pairs exceptionally well with chocolate. It can be used for the center of a layer cake, the top of the cake, or a fruit pie or tart. 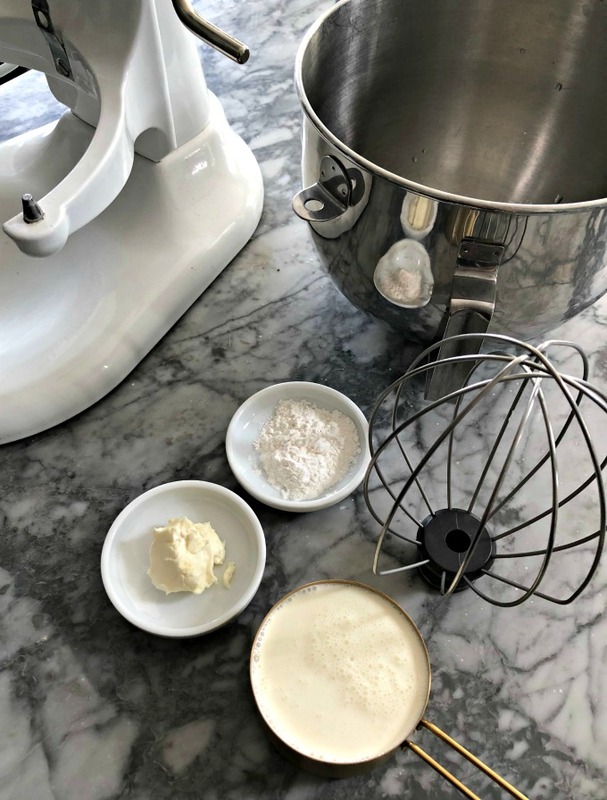 The Ingredients are simple, but a Kitchen Aid Standing Mixer comes in handy. I use this almost every day. (Amazon). 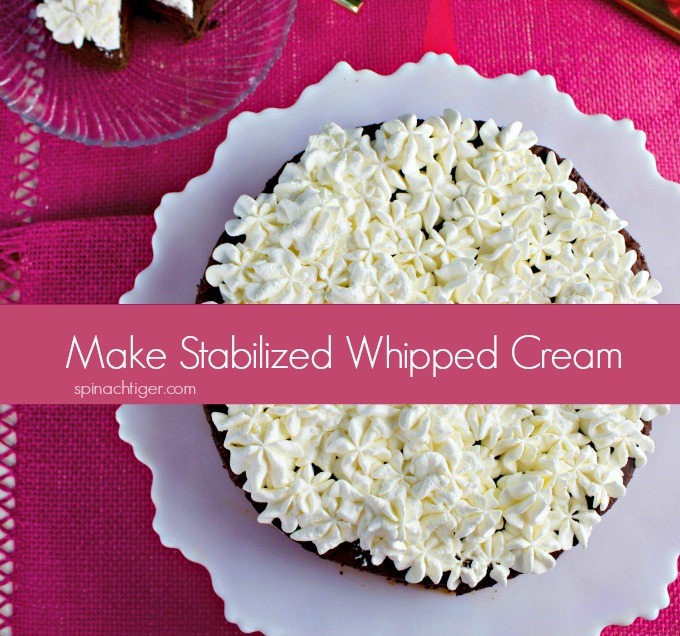 What exactly is stabalized whipped cream? 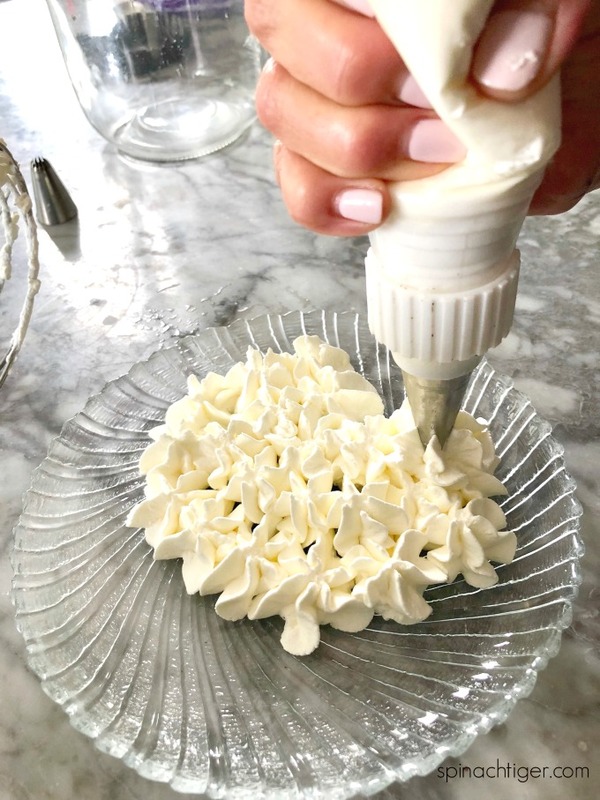 It’s a whipped cream that is piped and stays put. This happens when adding in a tiny amount of cream cheese (2 teaspoons per cup) and a little confectioner’s sugar. Since I used confectioner’s sugar from Swerve (sugar free), I only needed one tablespoon. It came out just perfectly. I used a stabilized whipped cream to fill this chocolate cake and to top this chocolate pie. My favorite way to use a stabilized whipped cream icing recipe is to top a flourless chocolate cake and then add berries. Flourless Chocolate Cake with Berries (sugar free version) recipe here. 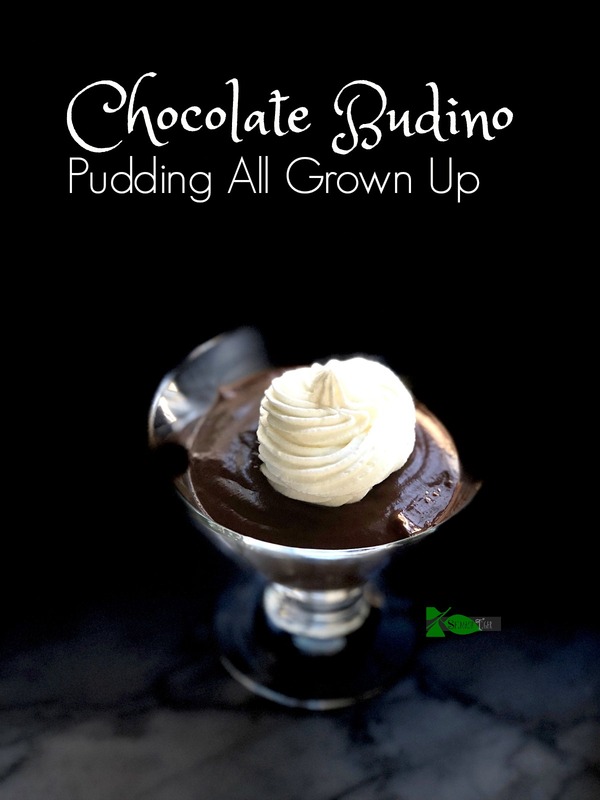 Here is a sugar free version of chocolate budino. Here is my Zuni Cafe Flourless Chocolate Cake. It’s important to make sure the bowl is very cold. I use my kitchen aid bowl and fill it with ice and then dry it once the bowl is cold. I use heavy whipping cream that is also very cold. If the cream isn’t cold, it may get gloopy. Then take a piping bag and pipe away. You will be amazed that your whipped cream will stay this beautiful for a few a days. This means you can make a lovely dessert like this flourless chocolate cake a day in advance and it will look look exactly the same, and taste great. 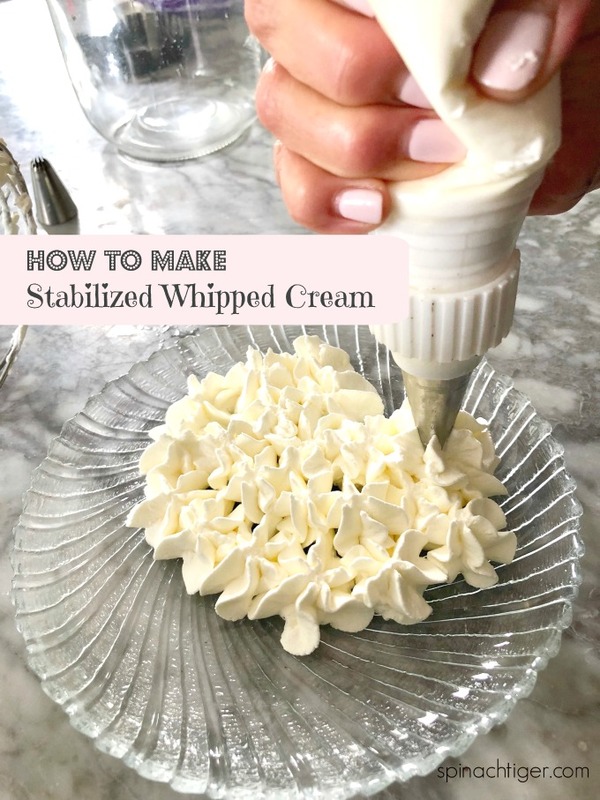 How to Make Stabilized Whipped Cream that will stay firm and you can pipe for your beautiful desserts. Make sure your bowl and heavy whipping cream are very cold. Cream cheese must be at room temperature. Whipped cream cheese in bowl. Add Confectioner's sugar. Add heavy cream until you get a consistency that stays on the spatula when you turn it upside down. Pipe in piping bag. I used a 1M large tip. This cream will stay put in the refrigerator up to three days. Great for Cream pies and filling cakes. Can normal powder sugar works instead of confectioner’s sugar ? I am making an ice cream cake and was wondering if this would work frozen? Thank yoj. I don’t know about this being frozen. You can try and see. Thank you so much. I make the cake all the time.